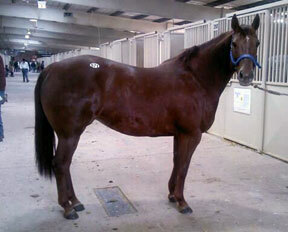 Park Fall Futurity [G2], finalist in the West Texas Derby [G2]. Adding a daughter of the great Dash Ta Fame to our broodmare band has been on the agenda for quite some time. The ones that come up for sale are generally older, don’t look how we want them to, had issues of somekind, or had a “nobody” family on the bottom side… As with life, patience is a virtue whilst horse shopping…Finally, we found one we liked…and I mean WE, (both William and I) This mare lives up to her name; Dash Perfect. It’s really hard to find much to complain about with her. She is built like a rodeo horse ought to be with sturdy bone & foot, great forearm & gaskins and a pretty head.! She did well at the track, winning just over $16K. Having said all that, the best part about her might be her age!!! We are excited to have her around for years to come and carry on this great lineage! The $100,000 Superstakes Barrel Race in OKC in 2011 was won by Nisa Berry riding Jess Gonna Be Famous - a mare bred the same way as Dash Perfect (BY Dash Ta Fame out of a daughter of Mr Jess Perry) Dash Perfect had a fabulous colt this spring by Sixes Royal. We can’t wait to see how this mare produces for us off 99!